When you want something beefy and cheesy, look no further than this Ground Beef and Cheddar Casserole Recipe. It is excellent. I feel like this casserole is really filling and satisfying…probably because it addresses all of the things I crave most: meat, carbs, and cheese. This is a really easy Weight Watchers Casserole that you can put together quickly for a weeknight dinner and the family will love it. The bell peppers and zucchini give it a nice flavor and bulk it up some too. It’s also a sneaky way to get those veggies in for the kids! When I was making this, I felt like Honey Boo Boo’s mom making one of her “multi-meals”….but it really is an all in one dish! Carbs? Check. Protein? Check. Dairy? Check. Vegetables? Check. See? It is a multi-meal! Everything you need in one fantastic casserole. Enjoy! 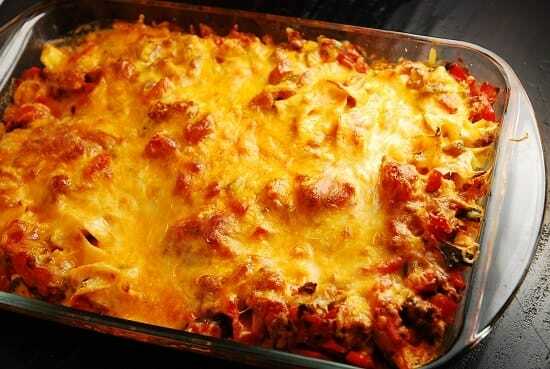 A delicious and easy casserole recipe that will be a hit with the whole family. Cheesy, beefy and full of flavor, it’s also incredibly satisfying and makes great leftovers. Preheat oven to 425 degrees. Spray a 9” x 13” baking dish with non-fat cooking spray. Cook noodles according to package directions, drain and place into a large bowl. Mix in the sour cream and parmesan, and then pour into baking dish. While the noodles are cooking, spray a large, nonstick skillet with non-fat cooking spray, and add in the garlic. Cook until tender and fragrant, about 2 minutes. Add in the ground beef. Season with salt and pepper, and cook until no longer pink…about 5-8 minutes. Add in the zucchini, bell peppers and onions and cook until vegetables just being to become tender, about 3-5 minutes. Add in diced tomatoes, dried oregano, dried basil, and dried parsley, bring to a simmer, and cook until the sauce begins to thicken, about 3-4 minutes. Season with additional salt and pepper as desired. Empty the beef and vegetable mixture over the noodles, and evenly sprinkle the reduced fat cheddar over top. Place in oven and bake until cheese is melted and bubbling, about 20 minutes. Made this for dinner tonight and I’m a fan!! One of the children I nanny for proclaimed it “Delish”! It tastes great and %he serving size is enough to be filling. I made the recipe as posted but ‘looked about 3\4 of the bag of noodles. This is a keeper! Thank you for your great recipes!!! This was so delicious and full of flavor. Even the leftovers were great the next day. I used extra zucchini and only about 1/2 pound of hamburger. We will make this one over and over. Thank you! Great recipe; ingredients well proportioned. Made tonight and delivered half to a family having hard times. Will be making another casserole tomorrow to share with a relative who is following the Weight Watcher plan. No adjustments needed except had to cook the meat mixture little longer until the juice from tomatoes cooked down. VERy satisfying dish! If I used 12oz of the pasta instead of the 6oz, how much does that increase the points by? 1. 6 ozs of dried pasta is no where near enough to even lightly cover 9×13 pan, let alone have this dish serve 8 people. I figured was typo and must have meant 16 oz. Even then, pasta barely covered bottom of pan. 2. 16 oz. of fat-free sour cream was way MORE than enough. I halved that amount and even with 16 oz. of pasta, it was more than enough to provide a creamy and moist sauce base. The meat and veggie topping is great and provides a lot of moisture. This recipe is a winner! My sauce also did not thicken, maybe add a tbsp of flour might help. But it didn’t matter, the flavor was there and it was what I was looking for! Made this tonight… it is officially one of our FAVORITES!!! YUMMY!!!! This is an absolute keeper! My husband, the average, meat-and-potato man loves it! He says he now wants me to make recipes like this at least 3 times a week now! I love it! Finally something that we ALL agree on that is good and very Healthy at the same time! this was incredible. i accidentaly only bought one zucchini but it still turned out full of veggies. I used the mexican seasons another person suggested (replaced the herbs for cumin, paprika and chili powder. I used a can of Rotel to go with the mexican theme. Home run! Thanks! Good site and recipes, but the print button is difficult to find and, what is worse, displays a dull page without the picture. Most boring cookbook ever! Quick question on the total calories.. when I added it up I got over 320 calories per serving? I was curious of the calories for each product you used. Thanks. This was really good! My only problem was that it was kinda wet. I never could get the sauce to thicken up. Maybe next time ill drain out half the tomato juice. It was delicious anyways. I’m actually going to make this a freezer meal for my friend whose dad just passed. I made this recipe ahead of time on Sunday and I subbed spaghetti squash for the pasta. I cooked it tonight and it was soooo delicious. It smells great in the oven! Ooooo…I LOVE that idea! Thanks for sharing! Thanks so much for sharing these wonderful recipes with us!!! I made this last night and it was good, but I had an issue with the sour cream curdling. Any one else have this issue? It was not expired. I used light rather than fat free. I also think it would be delicious if you turned it into a Mexican dish replacing the basil, parsley and oregano with paprika, cumin and chili powder. You could try tempering the sour cream with a tiny bit of the pasta water to bring up the temperature. The shock of going from the fridge to being mixed with the noodles is what caused the curdling. Just curious how the calorie and WW point counts change if you use lean ground turkey instead of ground beef – thanks! Not by too much…maybe by a Point. Can you please verify if the 6 oz of noodles is the weight cooked or un-cooked?